Cataract is a clouding of the lens inside the eye and can result in the need for cataract surgery in Salem for some of our patients at the Medical Eye Clinic. The front part of the eye includes the cornea, the clear window of the eye; the iris and pupil, which control how much light enters the eye; and the lens. The lens is a lentil-bean-shaped structure that is clear. It and the cornea provide focusing power to the eye such that images may be brought into sharp focus on the retina. The retina is like the film in a camera, and transmits the image to the brain, where the miracle of vision is created. Good vision requires good focus. When the lens becomes cloudy, most often as a result of the aging process, the quality of the vision is degraded. The major symptoms of cataract are blurriness, light sensitivity and worsened color vision. These losses occur very slowly, usually over decades, and sometimes make it difficult for people to appreciate how much vision they’ve lost. In other cases, the vision loss makes it difficult for people to perform activities of daily living, like driving, especially at night; watching TV; reading and other near activities like knitting or model making. Cataracts always come on with aging. Anyone over fifty years of age has some degree of cataract. Just because a person has a cataract, though, does not mean that he or she needs cataract surgery. The determination of a surgical cataract is related to how dense the cataract looks when examined with a microscope, how much the visual acuity is diminished, and how much the vision is interfering with a person’s ability to function. While there is no specific combination of these factors that is always present, generally a vision of 20/50 or worse when measured on an eye chart, in association with a cataract that appears to be visually significant, will qualify a person for cataract surgery. Modern cataract surgery is a marvelous thing indeed for people who need it. While nothing in this world is perfect, we tell our patients that well over 99% of the time things go very well. One eye is operated on at a time, with the other eye following in two to three weeks if the person wishes. The surgery is done in an operating room, with the person awake, relaxed and comfortable. We perform our cataract surgery at Salem Laser and Surgery Center. The procedure takes ten to twelve minutes as a rule, and there is no pain during or after. Cataract surgery is performed with visualization provided by an operating microscope under sterile conditions. The cataract is removed using ultrasonic energy, high frequency sound waves. An artificial lens is used to replace the focusing power that is lost when the cloudy lens is removed. There can be complications of surgery, but they are rare. There are several new options for people who wish to decrease their dependence on glasses; these include toric implants and femtosecond laser treatment for people with astigmatism. Multifocal and accommodating implants can be used for people who are motivated to be able to see far and near without glasses. The availability of these options depends on testing that is done at the time of the preoperative evaluation, and should be considered if the surgeon recommends them. 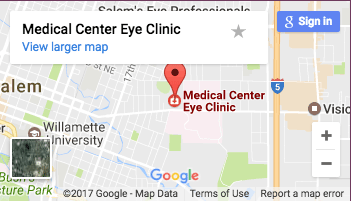 At Medical Center Eye Clinic we have three fine eye surgeons, Drs. Marcus East, Ryan Lapour and John Dodd. They are experienced at providing state of the art cataract surgery in Salem to our patients. If you are told that you have a cataract that needs surgery, you can be confident that the overwhelming likelihood of cataract surgery is good vision that is beyond your ability to imagine.